Here is my card for the Papertrey Ink October 2017 Blog Hop Challenge! I dusted off an older PTI set, Through the Trees, and added color with ZIG Clean Color Real Brush pens. The trees and the sentiment were stamped in Deep Lagoon, and embossed with clear embossing powder. 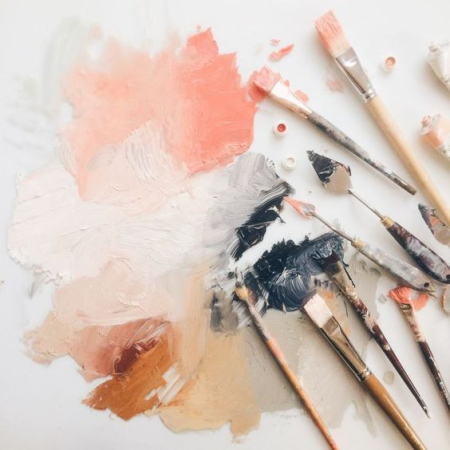 I was attracted to the colors and the rustic nature of the art. Supplies: Stamps – Papertrey Ink, paper – Neenah Classic Crest Solar White, Stampin’ Up! Island Indigo, Smoky Slate, inks – VersaFine Deep Lagoon, ZIG Clean Color Real Brush Carmine Red (022), Cobalt Blue (031), Orange (070), Yellow (050), embossing powder – Filigree Fine Art Powder clear. 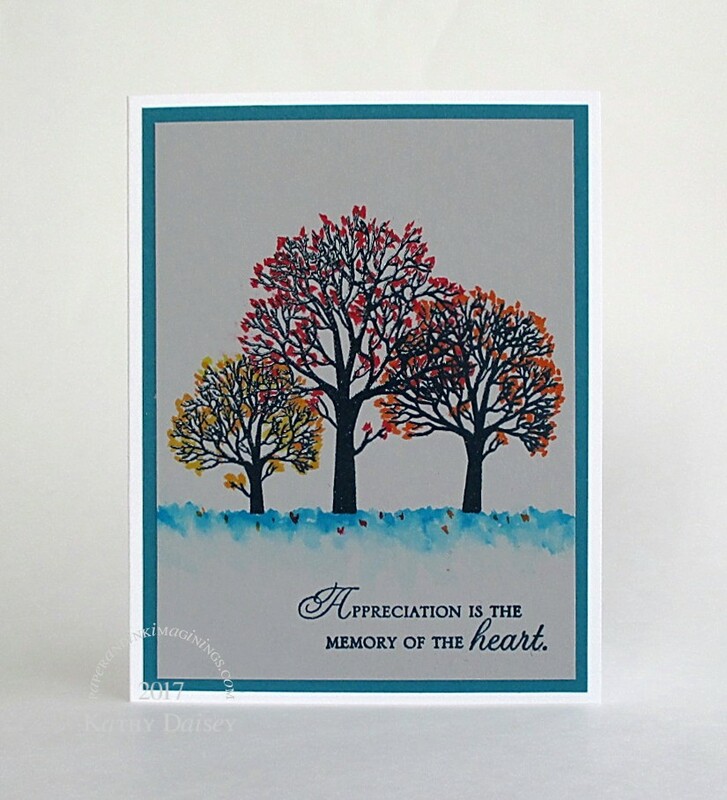 Categories: card, thanks | Tags: card, Neenah, Papertrey Ink, Papertrey Ink Challenge, Stampin' Up!, Tsukineko, VersaFine, ZIG | Permalink. Time for the Papertrey Ink October 2016 Blog Hop Challenge! 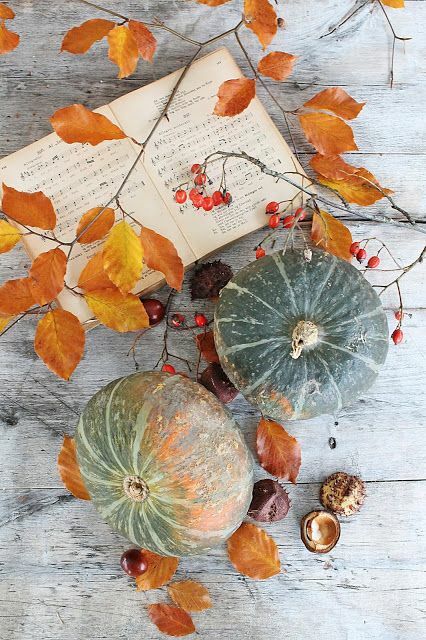 I was inspired by the wood grain background, and the orange leaves. So, I pulled out a sheet of birch wood veneer paper (16 pt, I think) that I got in a sampler pack from Paper-Papers. 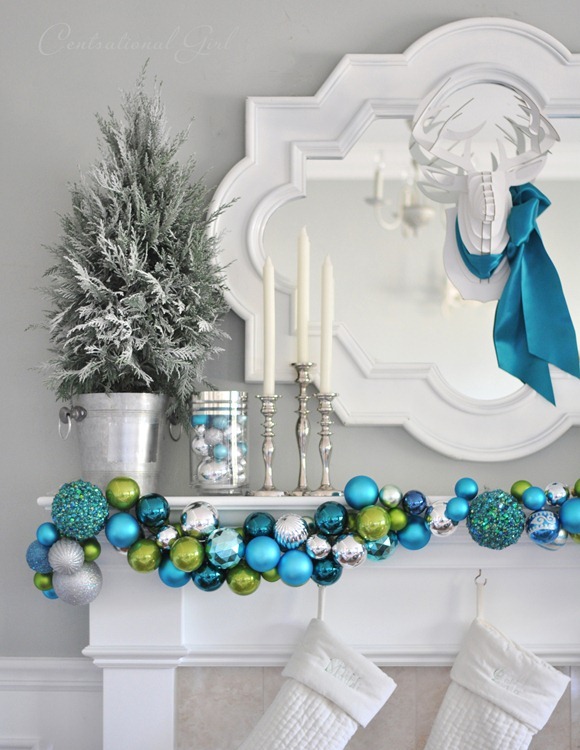 LOVE this faded, grayish birch. My beloved “Out on a Limb” set would give me a branch & orange leaves. “Just the Ticket” would give me a sentiment that would tie in the music background (Hero Arts, embossed in copper on vellum). It was nice to participate in a challenge again! Supplies: Stamps – Hero Arts, Papertrey Ink, paper – Paper-Papers Birch Wood Veneer, Papertrey Ink Vintage Cream, Stampin’ Up! Chocolate Chip, Pumpkin Pie, Vellum Paper, inks – Stampin’ Up! Daffodil Delight, Pumpkin Pie, VersaFine Vintage Sepia, dies – Lawn Fawn (stitched rectangle), Spellbinders (rectangles), sequins – Doodlebug Designs, embossing powder – Stampin’ Up! Classy Copper. 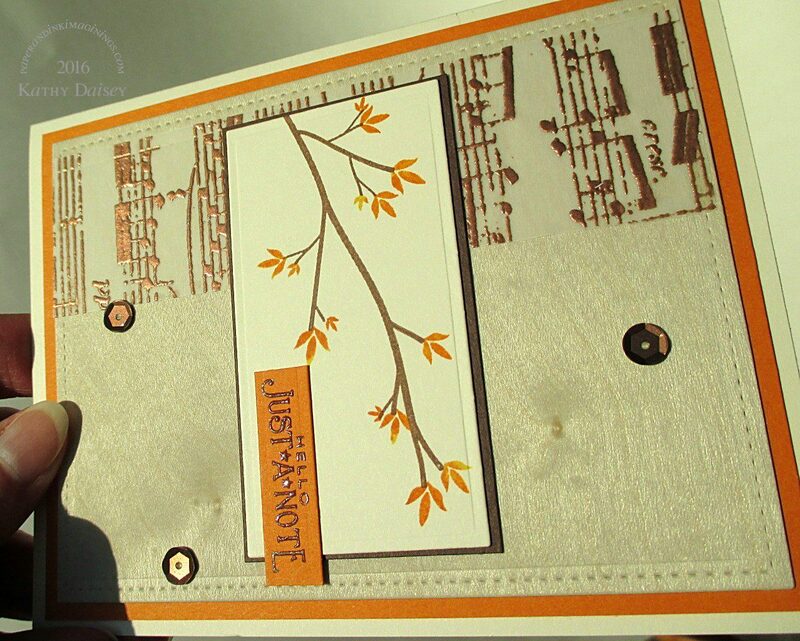 Categories: card, note, thinking of you | Tags: card, Doodlebug Design Inc, Hero Arts, Lawn Fawn, Paper Papers, Papertrey Ink, Papertrey Ink Challenge, Spellbinders, Stampin' Up!, Tsukineko, VersaFine | Permalink. I haven’t completed a challenge in a few months. I created today’s card for the Papertrey Ink August 2016 Blog Hop Challenge. As usual, I struggled with supplies for this challenge. I haven’t bought any new stamps from Papertrey Ink in a while, so you have definitely seen me use this set for a challenge before. I stamped the flowers in navy, then masked and stamped the stems in navy. When dry, I used an aquabrush to “paint” the flowers. I wasn’t sure how well the Vintage Cream cardstock would hold up to water, so I was very careful to keep my brush wiped off fairly well. Supplies: Stamps – Papertrey Ink, paper – Papertrey Ink Vintage Cream, Stampin’ Up! Blushing Bride, Night of Navy, inks – Stampin’ Up! Blushing Bride, Night of Navy, VersaFine Onyx Black, dies – Lawn Fawn, sequins – Doodlebug Designs, embossing powder – Ranger Silver Pearl, twine – MarkerPOP. Categories: card, caring | Tags: card, Doodlebug Design Inc, Lawn Fawn, MarkerPOP, Papertrey Ink, Papertrey Ink Challenge, Stampin' Up!, Tsukineko, VersaFine | Permalink. The inspiration for the Papertrey Ink April 2016 Blog Hop Challenge caught my eye, but I didn’t think I could dig anything out of my Papertrey Ink supplies to execute a design. So, I decided to go off of the inspiration’s ombre scheme and incorporate the dotted lines (by embossing with “stitched” dies). 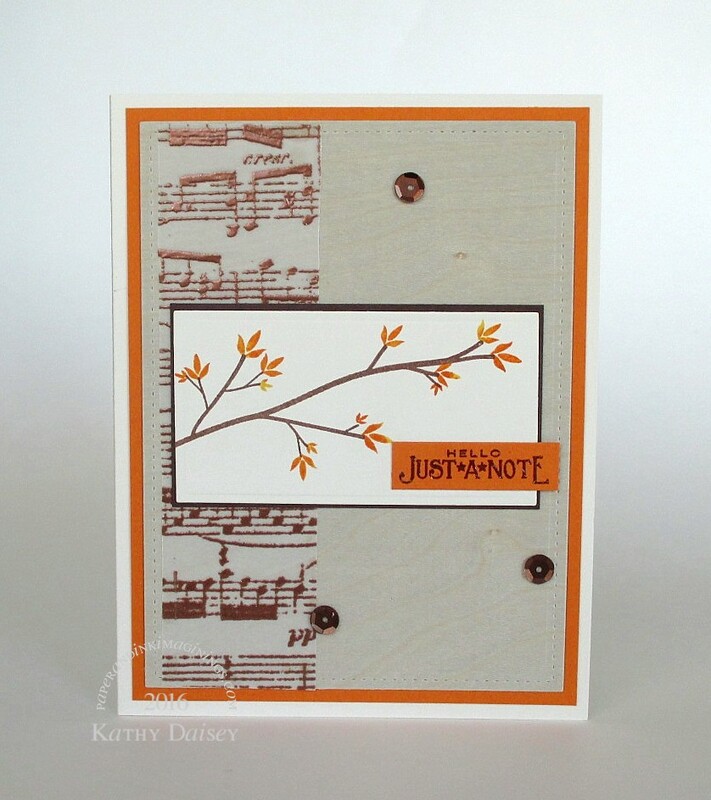 Supplies: Stamps – Papertrey Ink, paper – Papertrey Ink Kraft, Vintage Cream, inks – Stampin’ Up! Blushing Bride, Pink Pirouette, Regal Rose (retired), VersaMark, dies – Lawn Fawn (stitched hillsides, stitched rectangle), Taylored Expressions (banner), sequins – Pretty Pink Posh, embossing powder – Stampendous Detail Gold, metallic cord – Stampin’ Up! (retired). 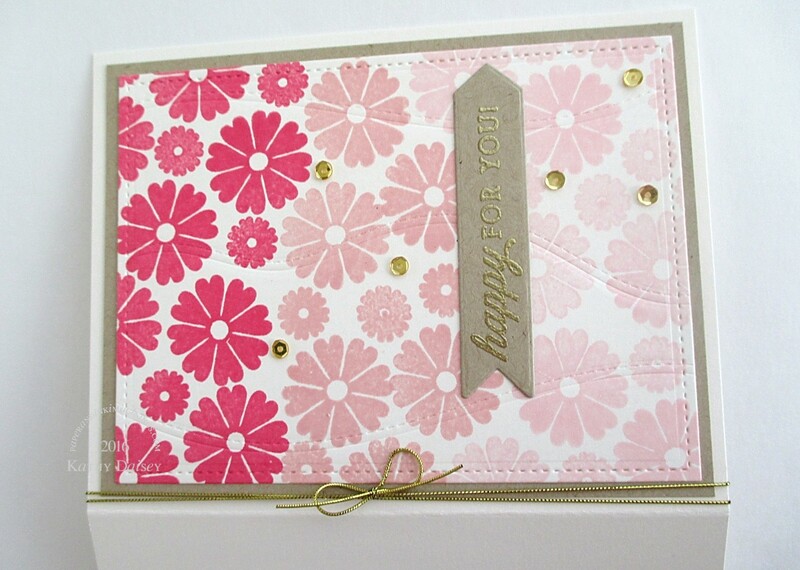 Categories: card, congratulations, encouragement | Tags: card, Lawn Fawn, Papertrey Ink, Papertrey Ink Challenge, Pretty Pink Posh, Stampendous, Stampin' Up!, Taylored Expressions, Tsukineko, VersaMark | Permalink. I have been unsuccessfully chasing (not catching) my mojo for over a week. SIGH. This morning, I saw the current Papertrey Ink Make it Monday #245 Color Isolation challenge, and poor mojo peeked out from under the couch. I can do this. A very literal interpretation, but it turned out beautiful. I fussy cut the carnation, used second generation stamping on the leaves and die cut those. I added a few Swarovski Aurora Borealis crystals, and they really pop in person (so hard to photograph). Supplies: Stamps – Clearly Besotted, Hero Arts, Papertrey Ink, paper – Canson watercolor, Papertrey Ink Vintage Cream, inks – Stampin’ Up! Green Galore (retired), Smokey Slate, VersaFine Onyx Black, watercolor – Sakura Koi, dies – Hero Arts, jewels – EK Success Swarovski Elements, embossing powder – Filigree Fine Art Powder clear. 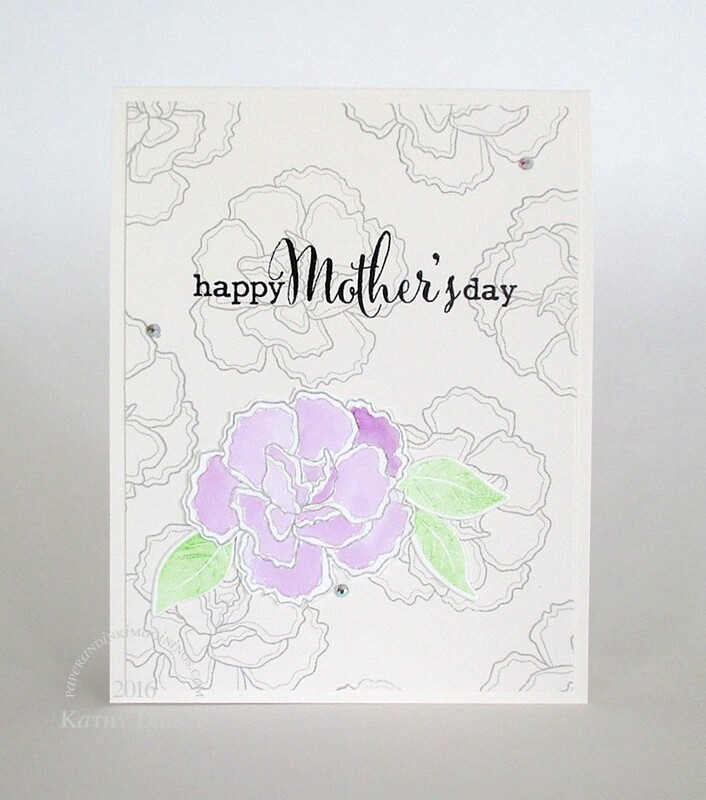 Categories: card, Mother's Day | Tags: Canson, card, Clearly Besotted, EK Success, Hero Arts, Papertrey Ink, Papertrey Ink Challenge, Stampin' Up!, Tsukineko, VersaFine | Permalink. I haven’t been participating with many Papertrey Ink challenges lately, but this week’s Make it Monday #241 – Ombre Stenciled Backgrounds caught my attention. Instead of an ombre stenciled background, I made an ombre stenciled element (which covers the entire card front, if that counts!). I die cut a onesie, and heat embossed “cute as a button” on the chest. Then, I blended some old Stampin’ Up! colors – for some reason, this designed itself in my head as orchid/purple. Placed the stencil and did some more blending. I needed a button to go with the sentiment, but it had to be a soft faux button – no real buttons on onesies! So, I die cut a button, and threaded it (that took the most time!) with embroidery floss (one strand only). I thought it worked well as a flower center near the sentiment. The glitter around the onesie neckline – that is a trick I picked up from Julie Ebersole at the very end of one of her Hello, Monday (1/11/2016) videos on Ellen Hutson’s The Classroom blog. The three flowers at the neckline – remember when all girl undershirts or slips had the little pink flower there? (my age is showing!!) In reality, I had an ink smudge that I filed off, but then the file mark showed (and it was off center). Three flowers to the rescue! Supplies: Stamp – Papertrey Ink, paper – Papertrey Ink Vintage Cream, inks – Stampin’ Up! Lovely Lilac (retired), Orchid Opulence (retired), VersaFine Onyx Black, dies – Papertrey Ink (onesie), Stampin’ Up! (button), stencil – Heidi Swapp, glitter – Stickles Crystal, flower punch – Fiskars, embossing powder – Filigree Fine Art Powder clear, embroidery floss – DMC. Categories: baby, card | Tags: card, Fiskars, Heidi Swapp, Papertrey Ink, Papertrey Ink Challenge, Stampin' Up!, Tsukineko, VersaFine | Permalink. 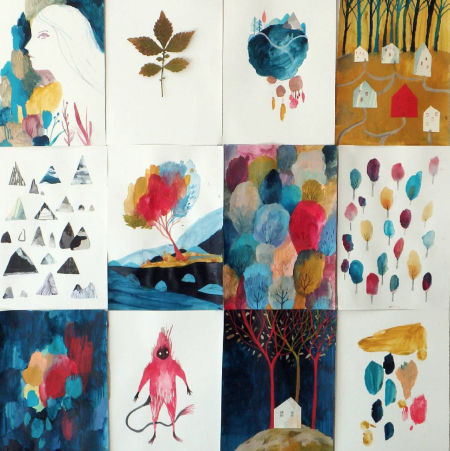 It is the 25th of the month, time for the Papertrey Ink November 2015 Blog Hop Challenge! I dug through my PTI stamps, and pulled out Borders & Corners Monagram Edition (which is now in the PTI vault). 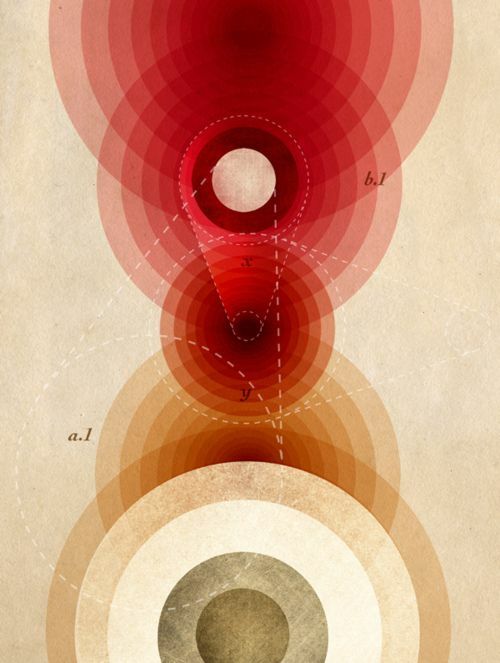 I embossed the dotted circle in silver, drew in strings with Wink of Stella. 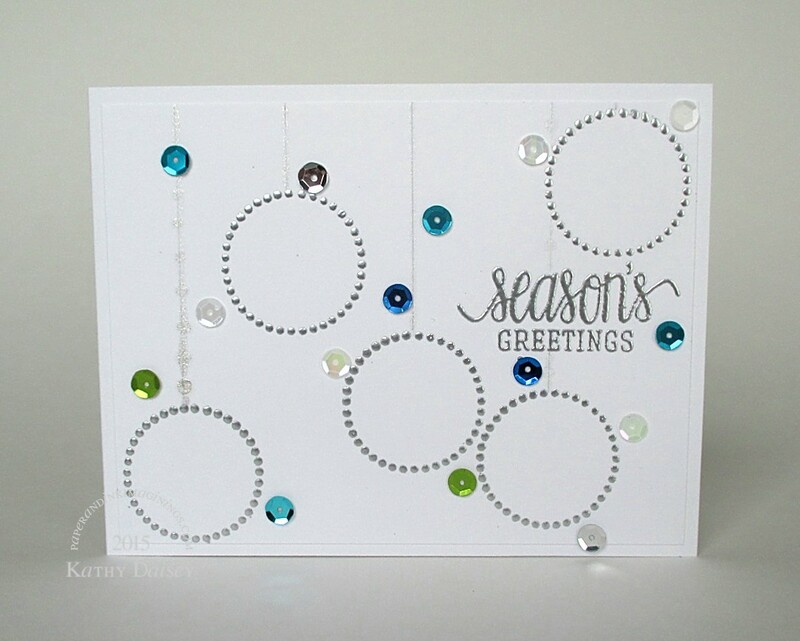 A silver embossed sentiment and lots of sequins finished the card. I am pleased with the final product (even with a Wink of Stella accident…). Supplies: Stamps – Hero Arts, Papertrey Ink, paper – Neenah Classic Crest Solar White, ink – VersaMark, Wink of Stella (clear), sequins – Doodlebug Designs, embossing powder – Stampin’ Up! Sterling Silver. Categories: card, holiday | Tags: card, Doodlebug Design Inc, Hero Arts, Papertrey Ink, Papertrey Ink Challenge, Stampin' Up!, Tsukineko, VersaMark | Permalink.